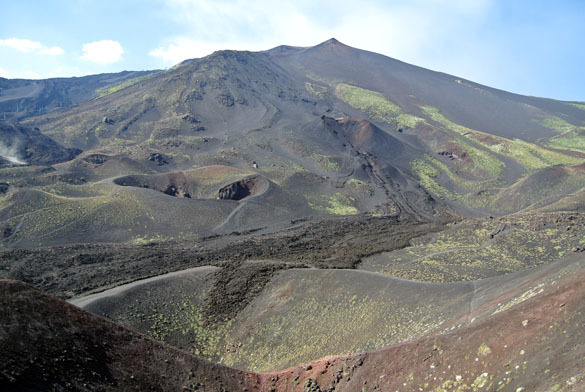 CATANIA, SICILY, ITALY–The very last field trip stop — and final event — of the International Bryozoology Association Conference was a trip to the south side of Mount Etna. We drove to a spot that had significant activity in 2000 and 2001. Several lateral craters appeared on the side of the mountain, and the lava flows buried parts of a restaurant and shop complex. They threatened to destroy the base of a cable car system, but firefighters with hoses managed to divert the flow by cooling it with water. My Belgian friend Hans De Blauwe and I decided to choose one of these smaller craters and hike to it within our allotted visit time. We picked this one in the center because of its symmetry and the flows that streamed from it. All of these features in and around this cone formed in 2001. We soon saw that our cone was the first of at least three cones descending in a row down the slope. 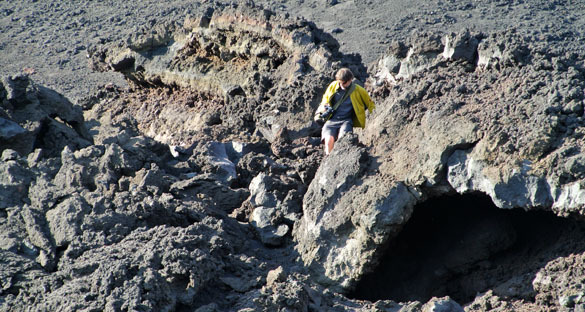 The lava flow shows very distinct levees on its sides where the lava lapped over its banks and cooled, creating a walled channel. There are many car- and house-sized boulders of non-vesicular basalt scattered about. I assume these were thrown from the throats of explosive craters. We found this very cool lava tube, indicated first by a long walled channel that apparently represents a collapsed portion of the tunnel. 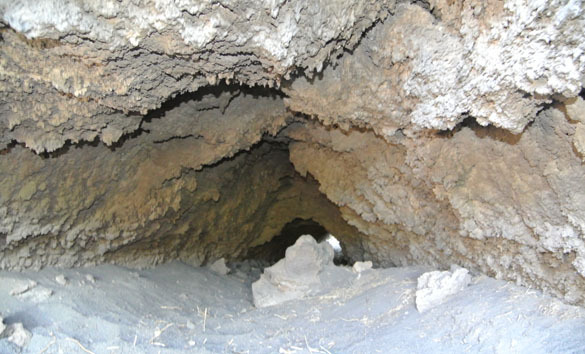 A lava tube is formed when the periphery of a flow cools into hard rock and the still-fluid interior empties. 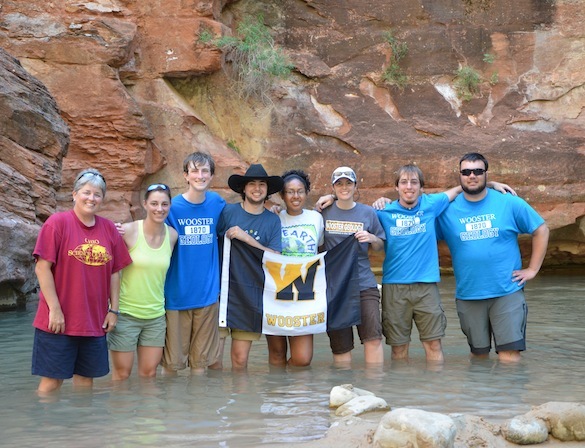 We explore a beautiful ancient example on our Mojave Desert field trips. Our lava tube is open at both ends. Here Hans is crouching in the larger of the entrances. I took a flash image of the interior. You can see small “lavasicles” (cooled drips of lava) on the ceiling, along with a white crust of some sulfurous minerals. Here Hans is picking his way through the aa flow. 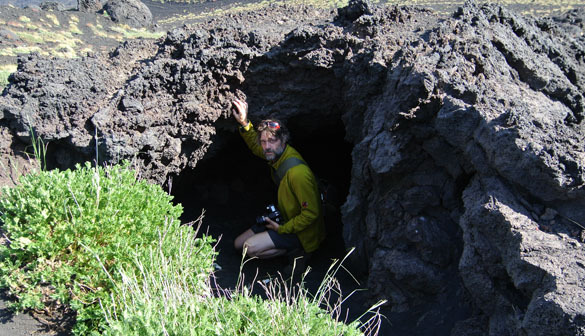 In the lower right is another lava tube that extends back about three meters. 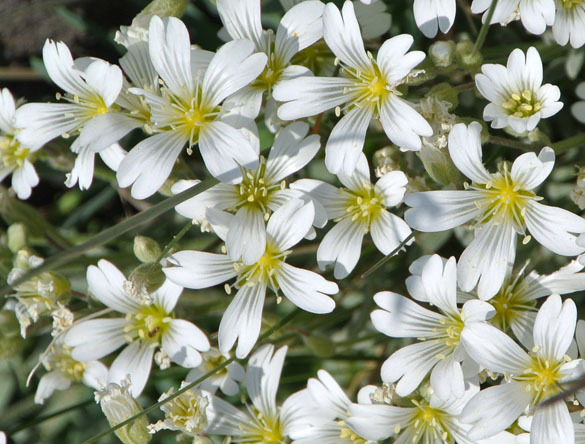 The flowers on this volcanic slopes are very interesting. Hardy pioneers, they are. 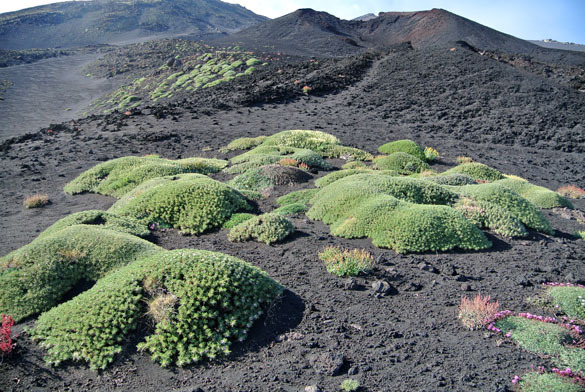 There are numerous clusters of these mounds of greenery. It appears that the plants settled on a bit of ash and then grew centripetally. The surrounding ash was eroded away, but the roots of these plants held onto their patches, eventually producing mounds as the surrounding sediment was removed. 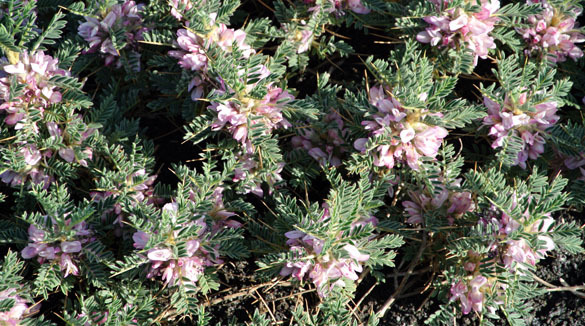 The mounds are made mostly of this spiny flowering plant. Maybe Hans will provide me with names later. 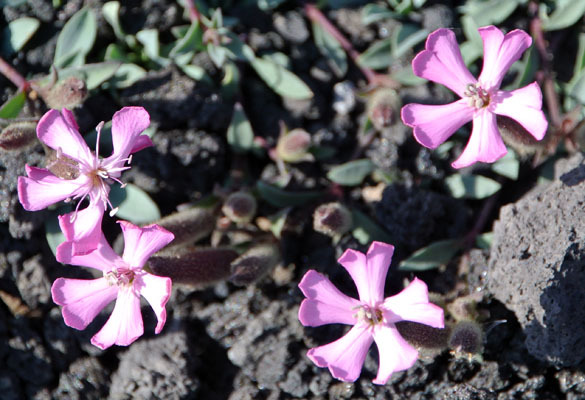 These purple flowers often form in rings around the bases of the mounds. Nice white flowers on the 2001 ash layers. Somehow there are always daisies around, even in the most surprising places. 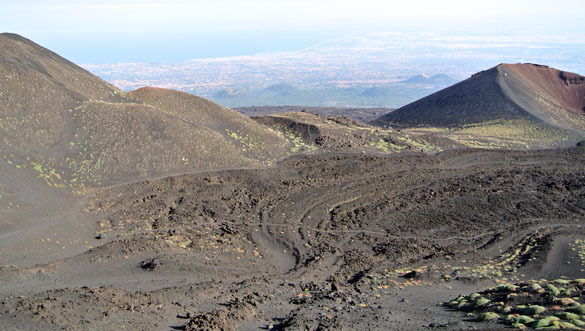 Finally, here is a view from our craters toward Catania and the coast. A 2001 lava flow is directly below us. In the middle distance you can see a series of small cones, many of which were active in historical times. Catania is certainly in a volcanic hazard zone. The geologists, though, worry far more about earthquakes here than eruptions. An eruption, after all, gives you much more warning than a sudden and devastating ‘quake. Considering all this, and despite the occasional tornado and blizzard, Ohio looks like one of the safest places on Earth. And to beautiful and much wetter Ohio I now return. 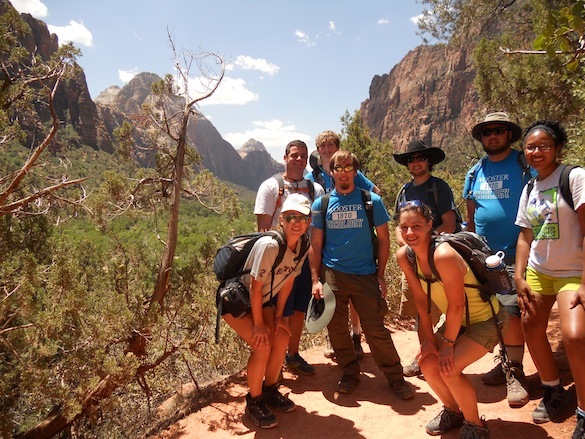 Zion National Park, Utah – Team Utah took a break from the volcanic field to explore some of Utah’s (more famous) sedimentary rocks. 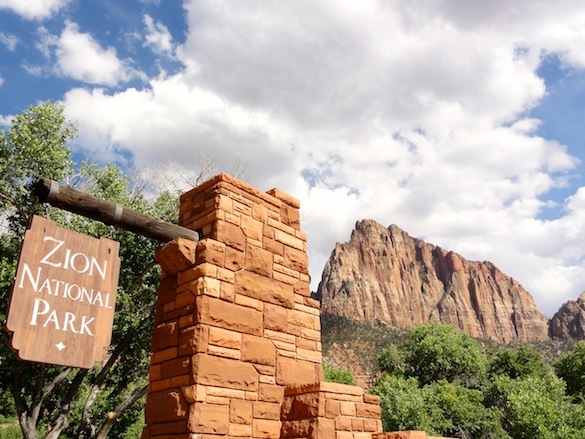 We visited Zion, Utah’s first National Park. 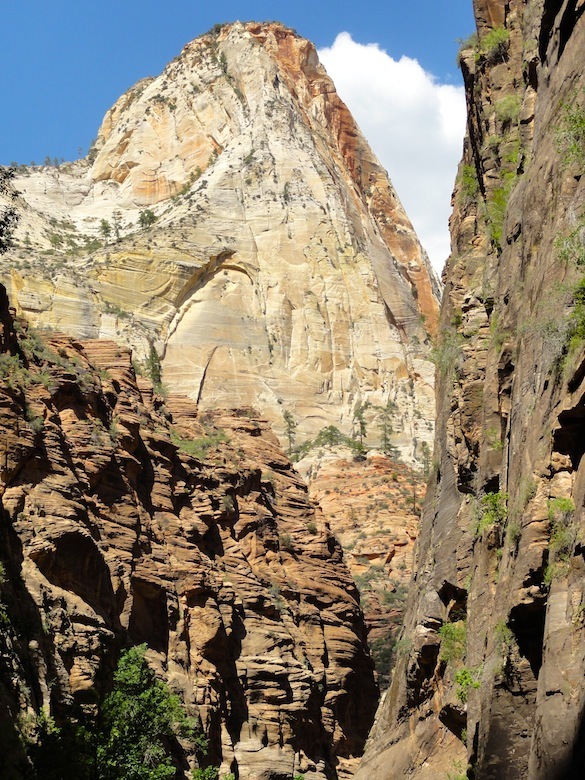 Zion is a geological wonderland, featuring striking sheer cliffs and narrow slot canyons. 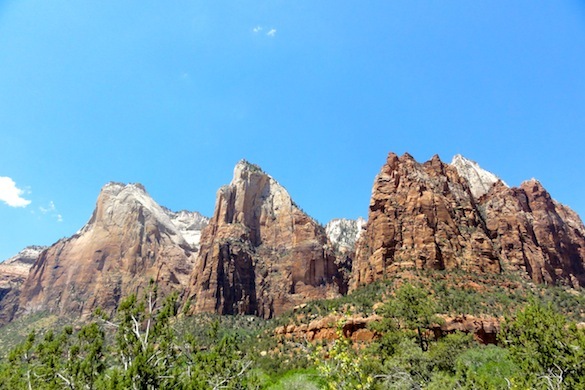 This is the Court of the Patriarchs, so named for figures from the Old Testament by Frederick Vining Fisher in 1916. Abraham Peak is on the far left. Isaac Peak is in the center. Jacob Peak is the white peak that can be viewed just beyond Mount Moroni on the right. View of The Narrows, a trail that winds through slot canyons in the famously cross-bedded Navajo Sandstone. 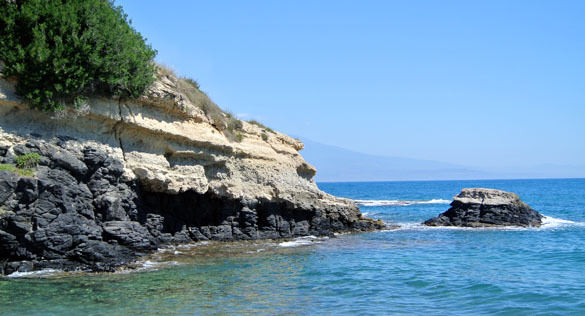 CATANIA, SICILY, ITALY–Today we had our last field trip associated with the 2013 International Bryozoology Conference. We traveled to the east coast of Sicily at Castelluccio, which is south of Catania and north of Syracuse. The weather could not have been better. It was, as a commenter has said, “impossibly beautiful”. The view above is of Early Pleistocene limestones resting on tholeitic basalt flows. As our guides said, in this place we could see the interplay of extensional tectonics, regional uplift, and glacially-controlled sea-level changes. The visuals were stunning. In the background you can see the east flank of Mount Etna. The limestones were of shallow-water origin and very diverse. 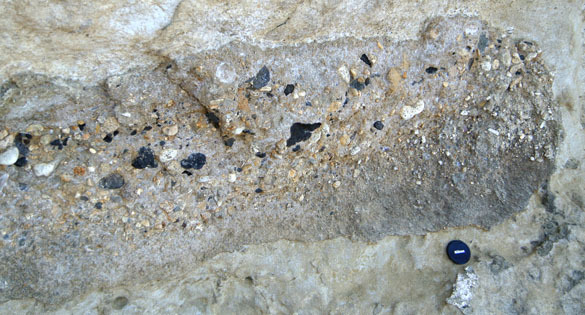 One layer was almost completed bioturbated (biologically stirred up) by crustaceans, producing a trace fossil of connected tunnels called Thalassinoides. Fossils were abundant in some units. Here is an horizon rich in scallop shells. These shells are often preferentially preserved because they are made of hardy calcite rather than chemically unstable aragonite like most other mollusk skeletons. The interactions between the basalt flows and the calcareous sediments were fascinated. Above you see a black basaltic dike cutting vertically through the limestones. Why there are no visible baked zones is a mystery to me. 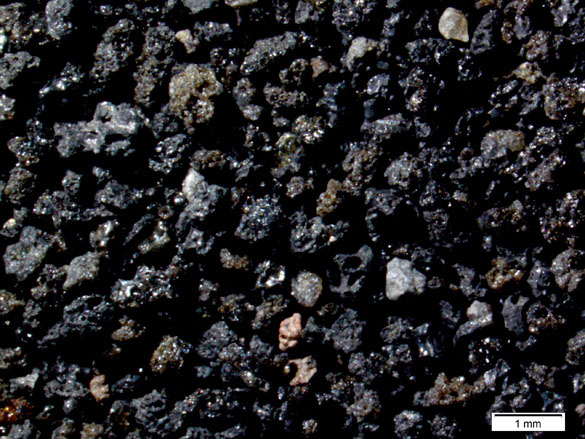 In this image we have basalt above and sediments below. The pink color of the limestones tells us they were cooked by the hot lava that flowed over them. 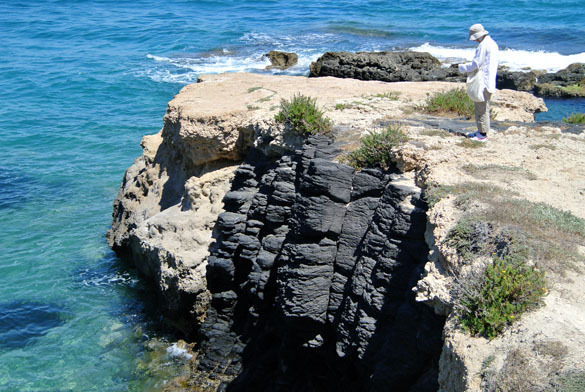 There are a variety of post-depositional geological processes operating at this outcrop. 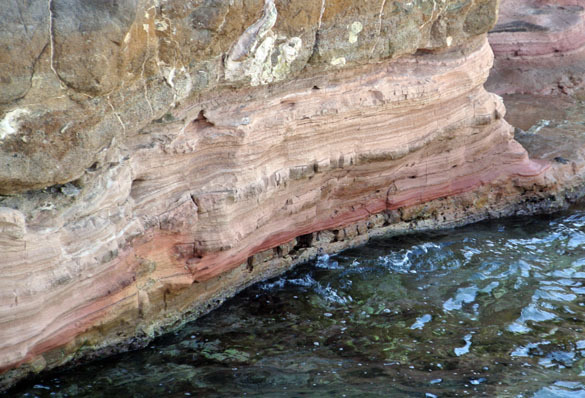 One of them is the superimposition of beachrock during sea-level highstands. Beachrock is a cemented sediment formed in the surf zone by precipitation of carbonate. This particular beachrock was plastered onto an eroded limestone cliff like stucco. You can see black basalt among the diverse clasts. Over it all rules Mount Etna, here viewed from the top of the outcrop. It was unusually smoky today, which does not show well in our photographs because of the murky haze. We headed to this behemoth for the second and last stop of our field trip. More fossil fish teeth this week. This impressive, barbed tooth is from the ancient chondrichthyan sawfish Onchopristis numidus (Haug, 1905). 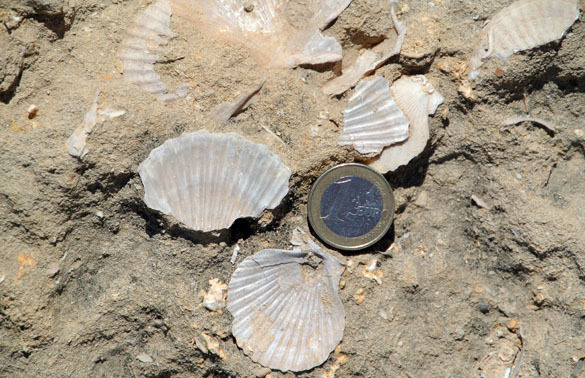 It was found in the Tegana Formation (Cenomanian, Upper Cretaceous) near Kem Kem, Morocco (and is yet another contribution from our alumnus George Chambers). These are all rostral teeth, meaning they are the sideways teeth on each side of the snout (rostrum) of the sawfish. They each have a barb for entangling prey. 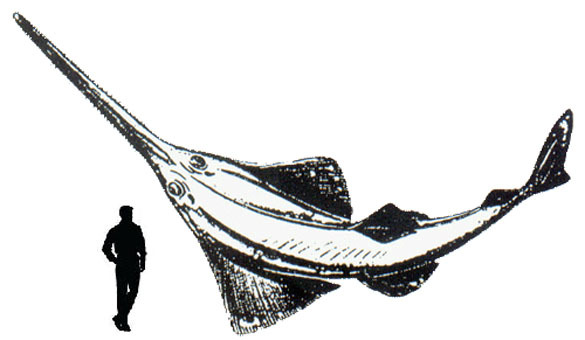 Like modern sawfish, O. numidus would have lived along the bottom and occasionally thrashed about, wounding smaller fish and crustaceans so that it could catch and eat them. 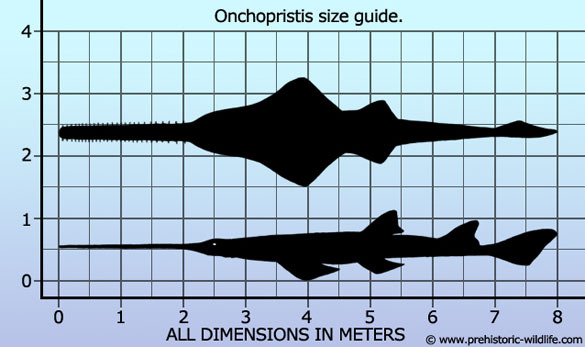 Onchopristis numidus was the largest sawfish known, making it a formidable predator. Of course, seeing it against a human profile makes it more real! 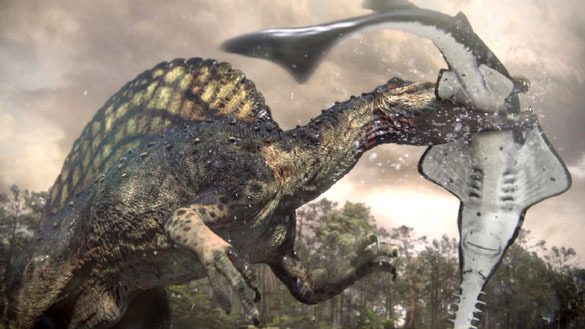 Despite its size, O. pristis had a famous nemesis: the dinosaur Spinosaurus. Barbed teeth of the sawfish have been found embedded in the jaws of this beast. The above image is from the show Dinosaur Planet, as is this Youtube clip of the two struggling (with one clearly losing). And yes, Spinosaurus is coming as a future Fossil of the Week! Martill, D.M. and Ibrahim, N. 2012. 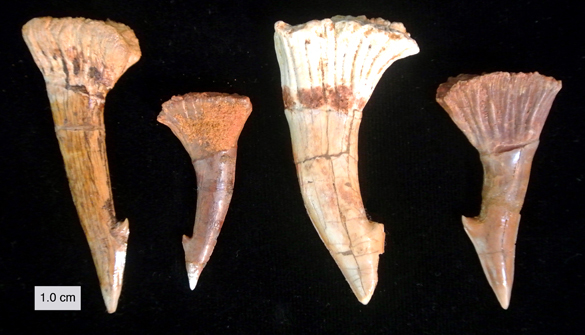 Aberrant rostral teeth of the sawfish Onchopristis numidus from the Kem Kem beds (? early Late Cretaceous) of Morocco and a reappraisal of Onchopristis in New Zealand. Journal of African Earth Sciences 64: 71-76. Slaughter, B.H. and Steiner, M. 1968. Notes on rostral teeth of ganopristine sawfishes, with special reference to Texas material. Journal of Paleontology 42: 233-239. Slaughter, B.H. and Thurmond, J.T. 1974. A lower Cenomanian (Cretaceous) ichthyofauna from the Bahariya Formation of Egypt. Annals of the Geological Survey of Egypt 4: 25-40.